Thanks to the ground-breaking work of researchers like Ted Palmer, Paul Gendreau, Don Andrews and Jim Bonta, the field of corrections has been engaged in conversations and efforts to realign around the Risk, Need and Responsivity (RNR) principles for almost three decades. RNR forms the foundation for Evidence-Based Practices in case classification world-wide today, as well as provides a framework for on-going case management. Through assisting and facilitating a great many implementation projects intended to realign systems and promote greater adherence to RNR, I’ve witnessed a variety of complex enterprises; engaged in harnessing assessment tools, criminogenic needs and matching treatment services and levels. Sometimes these efforts were refined by use of algorithms or through training in explicit use of professional overrides. Now however, I’m beginning to wonder if this kind of complex refinement is only creating barriers to fidelity, and if we aren’t, perhaps, ‘shooting-past-the-money’? Leaving aside the current renewed debate over determining the relative potencies and priorities of criminogenic factors, my interest is in finding a simpler syntax or business model for working with higher risk offenders, not a more complex one. Because in the end, I know it has to be understood by the person feeling the pressure to change; the client being supervised in order to counter the likelihood of rearrest. The Need Principle recommends that practitioners differentially target one or more of Central Eight criminogenic factors (e.g., Antisocial Peers, Antisocial Attitudes, etc.) according to the presenting needs of the client. This sounds straightforward, at least on paper. But in practice it’s a mess. Delineating priorities between several or more highly elevated criminogenic needs within an assessment profile becomes a guessing game. Too often the results assume a muddy brown color similar to what a novice painter gets when mixing too many colors. There is an alternative to this but it requires we humbly limit ourselves to three primary colors or domains of interest when helping our clients focus on a direction for change. Promoting prosocial change in the lives of higher risk offenders is, more often than not, tough, incremental business. As such we are best served by working with real, concrete progress markers. At a minimum, the markers need to provide a clear line-of-sight from where the client’s supervision started, where it is currently (at any given point), and where it is going. Reduced elevations on antisocial scales are too abstract, fewer antisocial peers is an unhelpful ‘dead-man goal’ (i.e., a dead person is more likely to succeed at it), and more prosocial organized activity if over simplistic and ignores levels of participation. Moreover, the domains (remember, only three) need to be substantively related to an array of desirable outcomes (e.g., reduced recidivism, employment satisfaction, marital/relationship stability). Given the above, what three target areas would you pick? The individual’s social support system. While MI can no doubt play a significant role when it comes to building motivation, motivation for changing one’s life is often a function of a lot more than simply talking one’s self into a plan, via consolidated change talk. At a minimum, it means acquiring and establishing the precursors or building blocks for change that Fred Hanna discusses in his book, Therapy with Difficult Clients: Using the Precursor Model to Awaken Change (2008). His precursor model outlines seven precursors some of which are mindsets (e.g., sense of necessity for change, hope for change) and others Hanna describes as meta-cognitions (e.g., willingness to experience anxiety, awareness, effort towards change, etc.). Mindset precursors are developed through insight, and meta-cognitive precursors through training and practice with reinforcements. The fewer weak precursors a person has, the readier they are for change. Therefore, the recommended approach for helping someone build precursor motivation is to begin with the weaker ones first. There are various self-control skills that compensate or replace each of the above deficit areas – all facets of poor self-regulation. New skills are harder to learn when they weren’t learned in a natural development sequence. For example, abstract thinking is normally learned and acquired in early adolescence (recall pre-algebra?). However, a twenty or thirty-year old can still learn abstract thinking (e.g., consequential thinking) via skill rehearsal with guided practice. Delayed development is not irreparable for any self-regulation skills that counter the above deficiencies; it only means that more effort will be required. In addition to effort, modeling and feedback are also important in order to successfully assist someone scaffolding new skills into place. Social Support is considered the most important moderator for all psycho-social treatment and interventions, regardless of type or client population. After considering the condition(s) the client brings to the intervention, the social support that they experience during and after treatment is the Big Dog, when it comes to determining outcomes. And yet we often lose sight of this factor, assuming perhaps (and wrongly) that it is beyond our purview of influence. Contain a higher proportion of people willing and capable of honest self-disclosure. All the above is readily tracked with simple sociogram diagrams, or through self-report survey tools or techniques. The harder work is helping folks learn to navigate differently. If you are thinking: ‘This is so simple, what’s the big deal?’ you are probably onto something – it is simple, but it’s not easy. Adages like “Good company influences more positive change than willpower ever did.” have been around for a long time, for good reason. When it comes to working with higher risk offenders, there is also a couple other aspects of social support that are important. 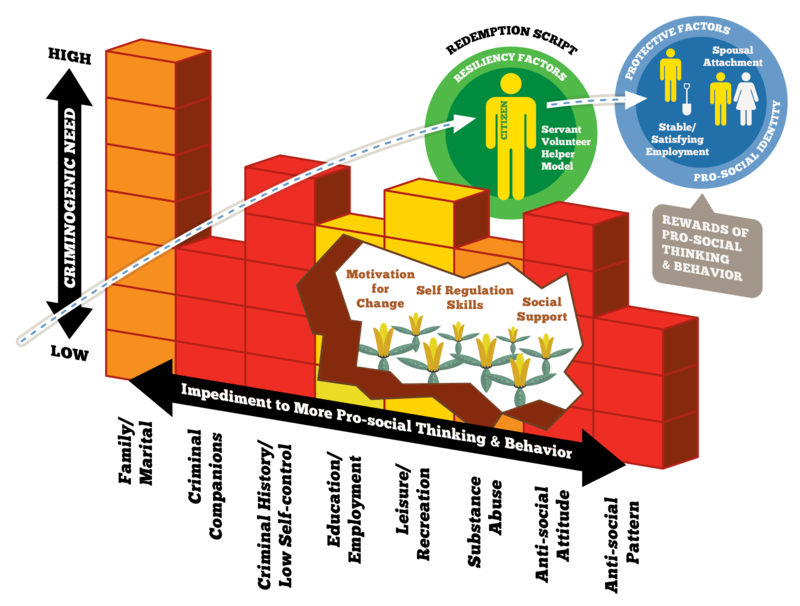 Implicit in effective social support are two essential things that are often in short supply with these clients: prosocial modeling and opportunities to practice new prosocial skills. Thus, there are many good reasons for the craft of good supervision to be concerned with enriching the social support of our higher risk clients. With all due respect to the principles of RNR, is it possible to simplify beyond criminogenic needs and concentrate our focus across many different kinds of clients? And if we did this, wouldn’t it assure that at the basic core, the services are of high quality when it comes to what matters in reducing recidivism? It is true that what we want are clients desisting from crime, but this is also just another ‘dead-man goal’. My guess is that what most folks and communities really want is for our clients to become is Self-Initiating, Self-Responsible adults. To do this our clients need to be equipped with three things; good enough motivation-for-change, self-regulation skills, and social support. J-SAT, a national consulting company devoted to the successful implementation of Evidence-Based Practices (EBPs) in corrections. Whether we’re training a particular assessment tool (e.g., LSI-R; Risk & Resiliency Check-Up; LS/CMI or YLS/CMI, etc.) providing training and coaching in MI, or working with practice models (STICS; EPICS, ESP, etc.) we review and consistently reinforce the use RNR.